In this episode, my guest is Allegra Sinclair of the Allegrativity Powercast. Allegra shares with us her passion to help women become more self-confident. She also shares tips to have a positive relationship with business clients and how to balance personal and business lives. With her vibrant personality, she encourages us to stop being afraid if we want to be more innovative in our business. Listen to this podcast and be ready to discover the awesomeness within yourself and handle your business and clients with more confidence. My journey is all about becoming completely unashamed, unabashedly who I am and that will take more than five minutes to accomplish. It’s vital to shedding the weight that comes of what somebody else thinks about you or thinks for you being more important than what you think yourself. Being a good coach is not about having all the answers, it’s about asking powerful questions. momentum [and] keeping focused. So positive self-talk is really important for that- both keeping focused and keeping motivation. It doesn’t take long to pour yourself in to whatever you’re writing. If you just stop for just a moment and think about who you’re talking to and why you’re talking to them. Here are Allegra’s answers to the questions of our Innovation round. Watch the interview to get the full scoop. #1 thing to be more innovative – Stop being afraid. If you keep thinking about it, you’ll find a reason not to, so just do it. Best thing for new ideas – I listen to the strangest mix of music because losing myself in that moment and just allowing myself to stop and breathe and think, I get the most amazing ideas. Favourite tool for innovation – brain.fm – helps me focus. Keep project / client on track – Trello for tracking and good communications. Differentiate – Get super clear on who you are, not who you think you should be, then BE that person. Get comfortable leading through others! Allegra suggested I interview Jack Born who is a software and marketing specialist helping entrepreneurs improve their business through automation, on a future InnovaBuzz podcast. So, Jack keep an eye on your inbox, for an invitation from me to the InnovaBuzz podcast, courtesy of Allegra Sinclair. Hi, I’m Jürgen Strauss from Innovabiz. Welcome to Episode No. 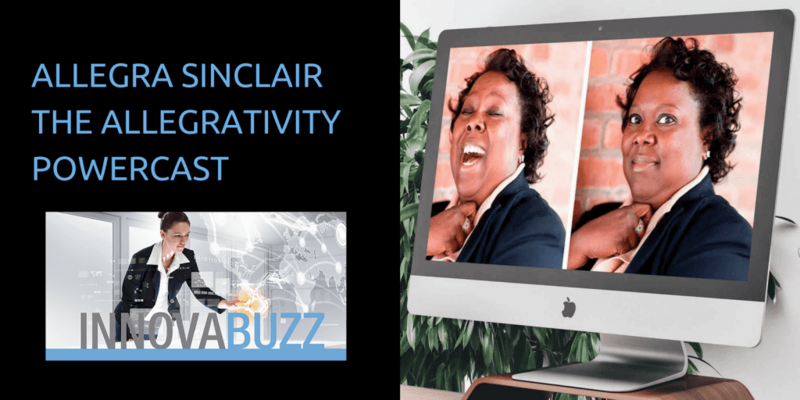 55 of the InnovaBuzz Podcast – designed to help smart businesses with an interest in innovation become even more innovative. In this episode, my guest is Allegra Sinclair of the Allegrativity Powercast, She’s a personal transformation coach and passionate champion for women. She helps women overcome their fears and achieve their very awesome best by building and increasing their self-confidence. This was a really fun and valuable interview – we are going to learn more about and be inspired by Allegra’s story as a “feel confident” coach and as a motivator for unlocking the true potential in anyone. So, without further ado, let’s fly into the Hive and get the Buzz from Allegra Sinclair. Hi I’m Jurgen Strauss of Innovabiz and I’m honored to have here with me today on this episode of the Innovabuzz podcast all the way from Raleigh-Durham in North Carolina, U.S.A. It’s Allegra Sinclair. Allegra is a personal transformation coach and passionate champion for women. She helps women achieve their very awesome best and we’re going to hear a lot about that today. She’s also host of the Allegrativity powercast. I really love that title. I love what you’ve done with that and it is a great podcast too. It’s one that helps you as you put it, ’Punch fear in the throat show up and tell your story.’ It’s quite vivid. Welcome Allegra. It’s a privilege to have you on the Innovabuzz Podcast. Thank you. I’m thrilled to be here. terms of the transformation coaching you do. But before we start talking all about that, let’s find out a little bit more about your background and you as a person. So when you’re a young child., what did you want to be when you grew up? Because it didn’t really occur in me that those two careers might conflict. So yes I wanted to be a firefighter but I wanted to wear the ballerina tutu and shoes. ballerina and something else that wasn’t a good fit at all! I don’t know but yes I wanted to be a firefighter. Don’t all kids want to be a firefighter and a ballerina? I have no rhythm. [chuckles] So that was not in my makeup. And you didn’t go into firefighting either. Yeah. Except perhaps, fighting the fires of doubts that people have. That is true. Different hose. Different fire. Yeah that’s right. What was your journey then from a young child through your education to becoming a confidence coach or a transformation coach? Well I’m thinking back to that Steve Martin joke. [laugh] That’s the Steve Martin joke “it was a long and windy trail”. I actually went to college intending to be an attorney. Then I spent a summer in between my sophomore and junior year working at a law firm and it was nothing like L.A. law on T.V. And I didn’t enjoy it and I was like, ‘Wait. You can have truth on your side and not win; I was so disillusioned.’ I didn’t know what to do so I pivoted away from my pre-law studies and then I studied political science and marketing. After I graduated I actually went to work in marketing communications for a number of larger corporations and then I’ll say I kind of sleep walked through probably the next fifteen years because I did really well and I kept moving up and going to bigger and better companies and bigger and more exciting roles and I was not miserable. But I did have one of those moments probably fifteen years to the date and I thought ‘I don’t know who this is wearing my clothes. I don’t know who this is driving my car.’ I just suddenly realized, I had built an entire career based on what other people expected or what other people wanted or who other people thought I was supposed to be and that was crushing and painful. And as I crawled through that whole process of shutting out the noise and figuring out who I was, I thought ’Well I’m going through this for a reason. I bet I’m not the only person who had that conversation with himself. There has to be a way for me to help other people either spend less time doing the thinking that is probably not for them or helping them make a conscious decision to do it versus feeling like, ‘I’m a victim and I just had to stay there because I had prepared for that career my whole life.’ I did Marketing Communications and Public Relations for some of the most fabulous companies in the world from Intel, Mayo Clinic, General Mills. So I had a resume that many would have envied but I just had that, “Come to Jesus” moment when I realized I wanted to give it all back. Yeah it’s interesting, isn’t it? I could relate to that in a lot of ways. Twenty five years in the corporate world and moving up to different jobs and new challenges and probably enjoying twenty three years of that but then all of a sudden…..That, ‘Hang on. I don’t enjoy this anymore and yes there are some external changes that perhaps influenced that but the realization that this is actually not who I am and I’m actually living somebody else’s expectations rather than your own dreams or desires.’ It is very confronting at the time isn’t it? But it sounds like you’ve come through it with flying colors. I wish I could snap my fingers and have it be over but it it will take a while and I’m committed to the journey so it’s okay. [Laugh] Isn’t life wonderful that way? Yeah that’s right. I like the message you give on, I think it might have been an interview that you did on somebody else’s podcast where you said, ‘Be more powerful and influence more people’ and I think that encapsulates a lot of what you were about. Yeah I love that. I love the servant’s heart approach because that’s definitely one of my values and part of that is being confident in yourself. I’ve got people that don’t like me and that hurts sometimes but I if I let that dictate what I do it takes us back to what we were talking about earlier- living somebody else’s life or somebody else’s expectation of career progression and so on. My little eleven year old me was like, ‘What is she talking about? I didn’t get invited to this party.’ But fast forward a couple decades, I was like, ‘Oh that was really good.’ She really meant that. But it’s also about one of the layers when you decide to do something different. So you said in order to impact more people you have to feel confident in that. It’s not the first hurdle but it’s one of the kind of second obstacles that you have to cross. I’m sure you experience this. There are people who thought you were crazy. They’re like, ‘Wait you have been in corporate for 23 years and you say you were unhappy. What’s wrong with you? Dude you should be loving your life!’ So part of it is also shedding that weight that comes when what somebody else thinks about you or thinks for you is more important than what you think because to them it might be crazy to leave corporate but for you, it’s undeniable. You just can’t do anything but be who you really are. I’m nearly being in business 10 years now but you know go back to something like the second or third year in the business and from then on I could never imagine going back into the corporate world or even working for somebody else. I won’t lie. I had a moment probably six months ago, because there was a whole lot of change going on in life and I thought, ‘You know to do my business well, I really have to show up.’ I can’t phone it in. You can do that sometimes in corporate.You don’t have to really show up and you could just kind of half step your way in and sit in the back of the room. I had somebody make an offer to me recently and it was on the back of a 5-minute presentation which I thought, ’Wow. Amazing!’ And I kind of laughed. I wasn’t sure whether he was serious or not but he assured me that he was serious and I laughed at first thinking he’s not serious. But then, I stopped laughing and said that’s not what I want to do. And reflecting back on that it was interesting because I didn’t even have to think about that. It doesn’t fit with what I want to do. It’s funny isn’t it? [Laugh] One of those moments when you had to do a little self coaching but you move through it very quickly. Yeah. Exactly. Now I came across this quote recently. I think it’s [from] Marianne Williamson. [It says] ’Our deepest fear is that we are powerful beyond measure.’ And she goes on to say something like ‘Our light not our darkness that most frightens us.’ And playing small doesn’t serve anyone. There’s nothing good about pretending to be smaller than what you might be and thereby making other people feel less insecure around you, which I thought was interesting… She goes on to talk a little religious and spiritual stuff but the key message is regardless of whether you’re religious or not the key message is that you’re here and you serve your best purpose by playing your A game all the time and helping other people serving other people. But you learn those lessons in smaller moments. So you see someone who’s playing small rewarded or you show up a little bit bigger than people are expecting and you kind of get that look that tells you that maybe you’re just a little too much. I think if you’re showing up half as much as you could be you could very well be hurting others who won’t show up fully because you’re not doing it. Yeah that’s right. So you’ve named her, Willemina I think. I just call her, Willy. bit differently. I just started paying attention to how people talk all the time and sometimes I think part of the fun of being a coach is I don’t have to know all the answers and I don’t know all the answers I just love to ask powerful questions. You can visit but but then you quickly need to move back to a place that better serves you. When she gets to the place of ’Does it always not work?’ or ’Does it always do that?’ challenging a lot of the personal pre-suppositions there that you might make in your self-talk, but then coming back and saying, ‘How’s that working for you?’ when usually ’It’s not really,’ so we should really change it. Well building a business and being an entrepreneur [are] a specific kind of spirit. That’s a particular kind of person right. And we’re more creative in that we see things that aren’t there and we’re more sensitive so I think it’s even more important when we’re doing something that maybe hasn’t been done before. Or it might have been done before but not by the people in our circle. So I think it’s even more important for us to really get a handle on how we talk to one another and how we talk to ourselves because sometimes a lot of the work we do is solitary and we need to be our own best, surely, in those moments to keep us going. Mmmnnnn.. You touched on a lot of interesting points there about if you’re working in your own business and particularly if you’re a solo business owner here often alone, there’s nothing else there to distract from the self-talk if you like. The idea or focus [are] really good one as well. Just before we started the interview, I was on a mastermind call and my accountability buddy was part of that – he called me out for losing focus. And was it okay that he called you out like that? Okay [laugh] I was going to say and how did that work for you? Well it did. [laugh] Because one of the one of the things I do suffer from, and I’m going to be totally open here and we’ve coined a phrase actually, we were talking about this yesterday with my business coach – the bright new shiny object syndrome. And I think I have to look at the notes we had we gave it an acronym that I don’t think it has been used before. I’ve got a number of projects on the go and I was talking about progressing in those. There are a lot and some of them are new ones. Some of them perhaps should be parked and I should be focusing more on on completing the ones that are further down the track- the ones that are going to give the best return on my time right now and that’s what he called me out on, which is fair enough. I call him out on other stuff too. It’s not a one way street. We both hold each other accountable. Good. [laugh] I think if you have core coaching skills, you can coach in any situation. But I do think it’s interesting that often I don’t say to someone, ‘Oh I can only coach in this area.’ My clients decide what we work on. So sometimes it’s life related. Sometimes it’s project related. Sometimes it’s business related. [And] sometimes it’s relationship related. It’s whatever they want but it’s interesting how growth in one area will impact another because we tend to want to see our life as separate. So if you’re having trouble being focused in your personal life and you say things are important to you but then you invest your time in ways that don’t enable you to do what you said you wanted to. If you kind of get your arms around that your personal life, it also helps in your professional life. Yes. Exactly. You mentioned earlier that we’re all human, we’re also people, so as a business owner, you’re making decisions based on facts, perhaps you might not be bringing personality to the table all the time but my view is, ‘Hey you’re still the same person,’ so you need that balance all across the board and if you’re not happy in your personal life, you’re probably not going to be happy in business either. You’re not performing at your best and vice versa. I understand very well making data based decisions but I also think sometimes in the entrepreneurial space, we are so content to sit back and wait for more data or for wait for someone else to tell us exactly. Well I did these three steps and then this happened and then we’re not in a bright shiny object way but then we’re running to do exactly what that person did. And that’s okay for some aspects but I’m a big believer in what’s your gut say. results. So maybe that did work wonderfully for that other person but maybe your skills, maybe your magic need to show up differently. So I think that when we take our personality out of it, that’s when you find people who are doing more of the copycatting, not really feeling like building their business and one day they wake up and go, ‘I’m not digging this anymore than I was digging corporate,’ because they’ve kind of removed themselves from it. Yeah. Exactly. They’re doing exactly the same thing like what they’re doing at corporate. Exactly. But you really don’t have any competition if you stay focused on who you are, on my super power because you can’t be me and I can’t be you. Jurgen: That’s right. I was just going to point that out that we come to that question near the end of the interview actually but yes you’re absolutely right. The other danger of course is paralysis by analysis. – Waiting on more data and we don’t actually take any action. I subscribe to the lean startup model in some way but also to the five success principles that they teach in NLP. The first one of those is knowing your outcome so you start off with where you want to go knowing your outcome and then the second one is take massive action so you don’t sit around waiting for data and then it’s behavioral flexibility so that’s where you kind of see what’s working what’s not working. Sorry. [It’s] Sensory Acuity. You’re becoming aware of what’s happening, observing and might be testing and then the behavioral flexibility which is testing and adapting and then the physiology and psychology of excellence which is be as good as you can be all the time. I haven’t heard that before. It’s a great little model. 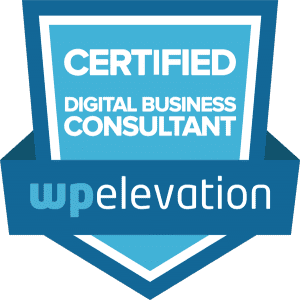 That’s the approach I take in pretty much everything – my business coach just published a guest blog post, on our blog so if anybody hasn’t read that it’s worth having a look at, because it takes that approach to writing content. Oh, okay. That’s a new unique approach. Well I’m just saying everybody now is talking about content marketing right, but so many people are trying to do the exact same thing and then they wonder why theirs doesn’t stand out. When in essence they are just like ‘wash, rinse, repeating’ what somebody else did. Yeah. I was looking at an interesting discussion yesterday and it was about Frank Kern’s programme. I was looking at some of his work. I look at these people as highly successful and then try to understand the process they’re following and what’s the higher level view of what they’re doing to understand how that might work for me and how I can then adapt that and add my personality to it and use it from a systems point of view. think it’s faster but it doesn’t take long to pour yourself on to whatever you’re writing. If you just stop for just a moment and think about who you’re talking to and why you’re talking to them. It shouldn’t take you 16 hours to take what to take the strategy that someone has talked about but then make it appropriate for you. To me it takes less time or the same amount of time as kind of trying to copy what some did because that doesn’t feel right. It doesn’t work either. Right? It’s not my story. That’s right. But at the same time you don’t have to start with a blank sheet of paper. That is true. You can look at various models and say, ‘This is a good model and this one’s a good model too and maybe I can learn some things from that,’ but then like you said put together your own. So tell us a little bit more about your coaching and the transformation coaching and how you you go about that. It is a big question I guess.. Sometimes it’s a transformation of a thought. Sometimes it’s transformation of a habit. Sometimes it’s transformation of what product you’re offering to the world rather how it is that you’re showing up. It starts with my client telling me what it is that they think is most important to them. Sometimes we just start organically and we just jump in with something that the client wants to work with. Other times I actually work with a tool that helps us actually examine the different levels of energy that you show up within the world and then once we figure out where you are right now and how that may be helping or hindering your success, then there are some more specific or kind of more structured action steps we can walk through that specifically deal with energy. So it is always very client driven and I’m always amazed at how edifying to see people discover the awesome within themselves. So it’s awesome right? When you get to work with someone and they see something in themselves or they remind themselves of something that they love before or they think back to times when they really did rock before because sometimes we skip over those successes too quickly. So I’m kind of a mirror, encourager and a cheerleader. On a path that the client designs, I show up every now and then with a mirror to help them see what they’re doing that’s working and help them see how awesome they are. Yeah I’ll talk about my business coach again so big shout out to Joanne, if you’re listening! She has a regular mastermind and the first thing you have to do when you come into that room for the mastermind is write up on a whiteboard your personal awesome for that particular month so it’s a monthly meeting and she talks about exercising your “awesome muscle”. As you said, it’s easy to recognize and acknowledge awesome in others. You see it on the news. You see it online or something you said, ‘Wow! that’s great. That’s really good,’ but then thinking about yourself, ‘What are the great things about me? or with what I’ve done in the last week that is challenging. I think it’s also interesting. At the very beginning when you’re introducing me you’re like, ‘Oh and she steps in the space of really powerful women and I got a little bit guff. And you just let them sit with that for a minute. I’m like, ‘So what would you think to yourself?’ And it’s just a great illustration of how other people will see value in you and there’s nothing wrong with that, right? Hmnn.. So maybe we need another inner voice – the confidence booster or whatever. Maybe there’s Billie and Willie. I don’t know. I’ll have to figure out what I would call the opposite of the confidence assassin. Mhhmnnnn. Yeah it’s interesting because you clearly position yourself to market to women and help women become more powerful is your motto. To me that’s just your niche market. You’ve chosen that as the niche market. When I listen to your podcast, there was nothing in there that turned me off. I found it very interesting as a man. I found that the points that you were talking about applied equally to men and so I think that’s a bit ridiculous if people have criticized you for that. Yeah, but I think we’ve got to be honest and say hey, we’re living in the twenty first century but unfortunately there are still a lot of people that have nineteenth century attitudes with a belief that women don’t have an equal place in the world. Yeah, it’s a little bit of mismatch in business, isn’t it? There’s probably women that you don’t necessarily get on with and won’t be a good match for you. There might be men that are good matches. It’s just that that’s the easy way to express it. It’s just helping other people help me. If someone says to me, ‘Hey who would be a good client for you?’ and I say, ‘Everybody!’ They’re not going to think of anybody because they can’t picture everybody. So if I said something more specific, even if they don’t find someone who is exactly what I said, they can kind of see what I was talking about in that person. We look forward to getting some really insightful answers and hopefully inspire the audience to help them do something awesome! What’s the number one thing anyone could do to be more innovative? Stop being afraid. I think often we’ll have an idea that’s a little bit different or that’s innovative and we are just too chicken to try it and for the most part what we do every day, if we get it wrong, nobody’s going to be bloody at the end of it so stop being afraid to do it. Now if I was working with the surgeon that would be different. Okay, don’t be creative, but for the rest of us, stop being afraid and try something. If you keep thinking about it, there’s a reason, so do it. Yeah. I think you said [to] exercise the courage muscle on one of the podcasts. What’s the best thing you’ve done to develop new ideas? So I have really eclectic musical taste. I love when I’m feeling a little stuck to go away like from all of the stimulus I have around me – computers, t.v., everything – and I listen to the strangest mix of music because I kind of losing myself in that moment and just allowing myself to stop and breathe and think I get the most amazing idea. So I could go from listening to rock “Man and Off,” to “Divo,” to opera to. I mean I just have this insane mashup of different types of music and it works for me. It really helps me get outside of what I think everybody else is doing and come up with something completely different. It’s kind of like that movie “Working Girl.” Remember when Melanie Griffith took things that were like completely unrelated and smash them together? Mixing up strange music does that for me. Okay, I love it. So do you still play the piano. Allegra:I do. Certainly not competitively and I don’t typically play classical but after 22 years, it doesn’t ever leave you entirely so it’s still in there. So you find that it’s something you do as well to kind of switch off and unwind? All right, Excellent! What’s your favorite tool or system for improving your productivity and allowing you to be more innovative? My favorite tool for productivity is brain.fm. Do you know that site? No, I don’t know that one. It was a couple years ago, everybody was getting into these like white noise sites. But brain.fm is actually brain waves that are designed to help you either relax or focus and there’s focus for just reading and then focus for work and I can be having one of those squirrel moments when I just feel like I’m not getting anything done and listening to brain.fm for thirty minutes, ‘Oh my gosh! I’m just way more productive.’ It’s my favorite tool ever! Now they have an app on my phone so I’m very happy about it. Okay, so you can put the headset on as well. We will definitely have a link to that one. I do remember it now…. What’s the best way to keep a client on track? I don’t know that I have the best way. It’s one of those things that we’re always working on, right? Well, I don’t know if it’s best but I’m going to tell you what I’m using now. I’m using a combination of Trello and areas on my website where it’s just communication between the client and I. The reason why I like Trello is I’m famous for writing stuff down on sticky notes and then they’re everywhere and I can’t find what I wanted or having like quick conversations on Skype or whatever but not taking great notes, so Trello forces me to keep like a running task list and a running commentary on the project that I can revisit. So I think it’s a great visual representation. It’s silly simple for saying what you said was important and how you’re spending your time. Are you spending your time on the things that you said were important or not? Because sometimes we do what’s right in front of us instead of what’s important. That’s right, which is destruction strategy or shiny object syndrome. That’s a really good suggestion. There’s a lot I love about Trello. We kind of use it for bits and pieces. And it is a really good for visual tracking of project and task. I love so much about that. Hey talk about that in future. I’d like to hear how that goes. Okay, I will. [laugh] What’s the number one thing anyone can do to differentiate themselves? Get super clear on who you are, not who you think you should be because that’s a wonderful tool I also like to use. So don’t answer these questions based on how you think they should be answered. There’s no perfect answer. So get super clear on who you are and then be that person, like relentlessly that person, because that’s a differentiate yourself. You and I could look at the same content but we’re both going to put it out there in a different way because we’re very different people. Yeah. I really love that a lot of people have given a similar answer to that and you said something just then that prompted an idea in my head and I thought well actually that’s because people put out content and then a lot of people struggle with putting out content. I’ve heard things like, and this is the inner voice,Willy, saying, ‘Oh I don’t have anything to write about or anything. People say there was somebody else who has already written about that but then they haven’t written about it in your voice. That kind of prompted that idea in my head straight away when you said that. It’s funny because when we’ll see something on the news or we’re watching a T.V. show or something with a friend or family member, don’t we always have an opinion? But when it comes to not getting content we’re like, ‘Oh well everyone’s already said it.’ Really? Because you have a lot to say about family feud five minutes ago and we’ve been talking about that show for like a bajillion years so I think you’re right. It is a willy situation where you just need to silence her a little bit. See that’s why I say punch her in the throat. My mom was so horrified that I said that because it just wasn’t ladylike but it’s just about silencing Willy so that I can come up with something different. So you do have something to say and if you don’t say it then who will? That’s right yeah. Nobody else is going to say it in your voice. What’s what’s the future for you and your business then? Well I was giggling to myself when you were talking about a team of people. In this next year, I’m already preparing to really get super clear about what my superpowers are and building a team of people who are excited about stuff that I’m not excited about. Because I’ve done a lot of one-on-one work and it’s oddly enough. Some of the friends that I was talking about before I met in former lives, because I’m kind of a code geek in my other life, so I love like ripping apart websites and playing in html and all these other things and they’re fascinating and creative but someone else could do those so looking forward, I’ll be focusing way more on the things that only I can do. And I’m actually looking into doing a lot of events or in person experiences, I should call them, because in my coaching space, there’s nothing like someone being in the same space as you and your molecules, getting all of them there really is no substitute for that and I think right now that the coaching industry is moving more and more towards, ‘Hey you can just do everything on Skype,’ and I’m not mad at Skype. I like Skype. But I think there is magic in someone actually being in your space. I know it’s not popular. Not a lot of people are doing it but I’m not afraid I’m going to be doing more of that where we get out and build community in person as well as using all the technology that’s available. No, that’s right. And you touched on something there that I’d like to do live events as well but I see the opportunity obviously for the leverage. I mean without Skype, we couldn’t be having this conversation. It’s really great and that sort of thing and with the podcast, I’ve spoken to people all around the world. Yeah it’s fantastic, isn’t it? Exactly. And so you can use a combination of the things and it’s a little bit like we talk about websites and we say, ‘Well you know, don’t get intimidated by the technology’ and so on because it’s it’s the same as what you would do in person. You know it’s what we talked about really have an opinion about something and you’re quite happy to have that discussion in person. So how do you translate that to an online content strategy? But the online content strategy doesn’t substitute for that. It’s just another way to do it. what it’s about one person can only do but so much. Even with Skype, putting the right systems in place just enable me to do even more without losing my mind because I’m big on self care as well. I don’t try to pour from an empty pitcher. But I am looking forward to being able to do even more going forward. Wouldn’t you just love a whole day to just hang out on the beach and like listen to podcasts? I’m so far behind on people’s content and there’s so much good stuff out there. I just have to free up more time but I’m more of that. Yeah. So I try to plan my commuting time such that it doesn’t take up a lot of my day because I see it as unproductive but recently I’ve changed that completely because I’ve decided commuting is probably the best time for me to listen to podcasts and I’ve got such a long list backlog that I want to listen to. That’s right. What’s the number one piece of advice you’d give to any business owner who wants to be a leader in innovation and in their field? If you want to be a leader in your field, get comfortable leading through others. When I say that, I mean the best leaders don’t always have to be out front doing things, getting credit, being seen, the best leaders sometimes lead from the back of the room. So I think get comfortable with leading in a different way to be the kind of leader you need for tomorrow. That’s great advice. And you know it speaks a lot to some of the things you mentioned earlier about building team and building community and connecting with people on a personal level, but as you say it might not be at the front and follow me. So where can people reach out and say I thank you for all that you shared with us today? Thank you so much. This was awesome! Who would you like me doing to interview on a future InnovaBuzz podcast and why? Oh my goodness. This is so tough for me. So I have someone’s name in my head already but I’m like, ‘Okay, is that the name I think I should say or is that the name that I want to say?’ So I work with someone so I’ll say right upfront appropriate disclosures. He’s a client and his name is Jack Born and he’s a software genius combined with a marketing genius and I think he used to work with Frank Current. But he sees opportunities that other people just think, ‘Oh this is just such a pain,’ and he creates solutions for them and he’s funny and he’s really smart. I keep teasing him he needs to work on a book about kind of the science of persuasion and marketing but he’s a fascinating conversation. [laugh] No, he’s not a coaching client. That was good and funny. Yeah I think Born is an interesting guy for you to chat with. Thanks so much for sharing your time and your insights with us today. This has been really good. I’ve really enjoyed this… Wish you all the best for the future of the Allegrativity Powercast and other business you’ve got going on and let’s keep in touch. I would love that. Thanks so much. It was nice to meet you. I hope you enjoyed meeting Allegra as much as I enjoyed this interview and of course, also learning about how she helps find the awesome within each of us! All the show notes for this episode will be at innovabiz.com.au/allegrasinclair, that is A-L-L-E-G-R-A-S-I-N-C-L-A-I-R, all lowercase, all one word, innovabiz.com.au/allegrasinclair, for all of the links and everything we spoke about in this episode . Allegra suggested I interview Jack Born, a software creator who helps entrepreneurs achieve more and earn more, on a future InnovaBuzz podcast. So, Jack keep an eye on your inbox, for an invitation from me to the InnovaBuzz podcast, courtesy of Allegra Sinclair. Now personally, I’m really glad you’ve listened to this point and I trust that you get great value from these episodes. Pop over to iTunes or Stitcher or Pocket Casts and subscribe so you’ll never miss a future episode. While you’re there, leave us a review, because reviews help us get found and tell us what we can improve and what you’d like us to cover, or questions you want answered on future InnovaBuzz podcasts.